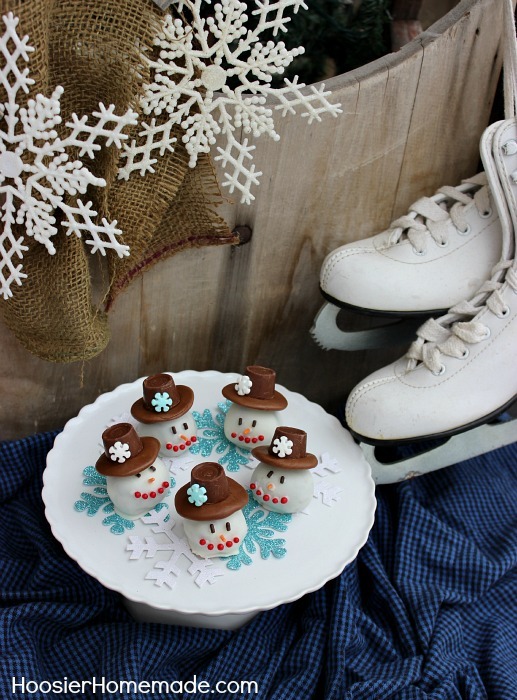 The Christmas decorations are down and the oven has cooled off, but just because the holidays are gone doesn’t mean we can’t still make a fun treat! 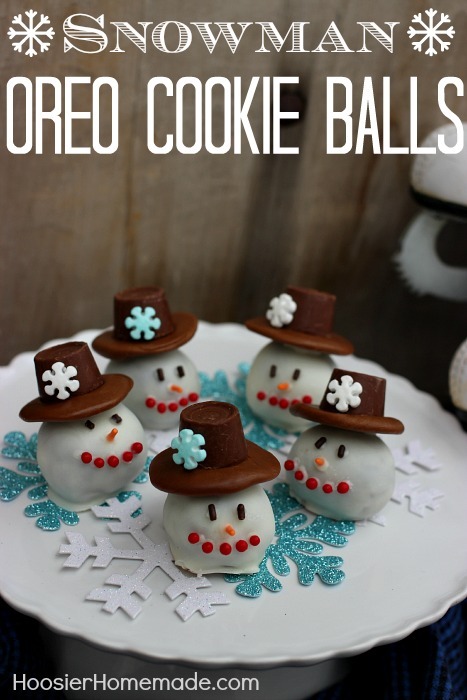 These Snowman OREO Cookie Balls are the perfect Wintertime treat! 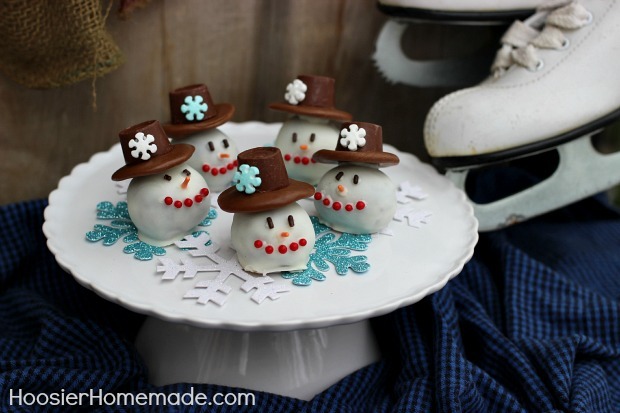 With just two ingredients, OREO cookies and cream cheese, plus chocolate for dipping, candy and sprinkles for the face and hat, these cute little Snowman treats would be fun for the kiddos to create as well. The ideas are endless with these OREO cookie balls! 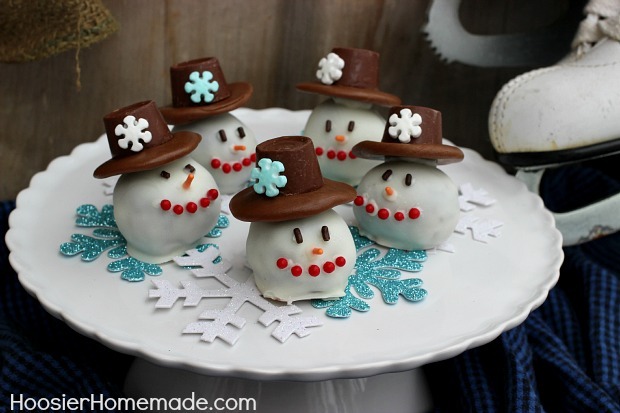 The Snowmen are fun to create, but you could also just add sprinkles or a drizzle of chocolate to the top. They would also make a perfect treat for Valentine’s Day! Who doesn’t love OREOs? Meanwhile, unwrap tootsie roll and heat in microwave for 5 seconds, mold into disk shape with your fingers. Add face to each cookie ball with white chocolate. Using a toothpick and tweezers for this is easiest. The decorating options are endless with these.Add sprinkles for an easy treat. Or make them festive by adding decorations for any holiday. Hi Jeni, no I did not dip mine twice. I’m wondering if you let them freeze long enough. They might have been a little warm from handling them. Either way, you can certainly dip them twice, it won’t hurt at all. Hi Sharon, use the full Oreo, filling and all. These are adorable! So fun! The snowflake accents are soooo cute! so cute liz! love the hats too! How adorable and creative! These are the cutest Oreo balls I’ve ever seen..